According to the theory of relativity, time dilation is a difference in the elapsed time measured by two observers, either due to a velocity difference relative to each other, or by being differently situated relative to a gravitational field. As a result of the nature of space-time a clock that is moving relative to an observer will be measured to tick slower than a clock that is at rest in the observer’s own frame of reference. If we have 2 clocks, one on earth assumed to be at rest, and one moving at 0.2c it can be seen the moving clock is running around 2% slower than the rest clock. So, 20 years on earth is equivalent to 19.6 years for the moving clock. It is not until we get up to speeds that are a large proportion of the speed of light that time dilation becomes significant. For example at 0.75c the moving clock is running at 66% of the rest clock, ie 20 years on earth becomes 13 years on the moving clock. Should you disagree with my conclusions, or think I’ve made a mistake, please be sure to let me know. I will post any corrections or alternative ideas on the website. The Hubble site Web Page is here. 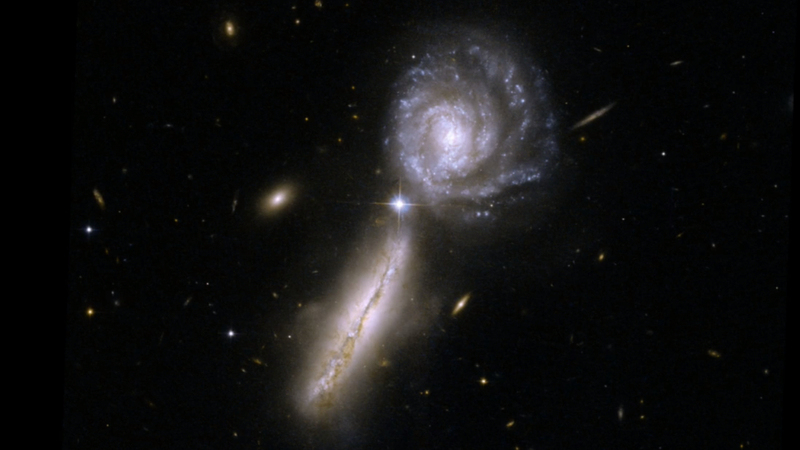 An image of a galaxy collision captures only one stage of billion year long collision process. This visualization of a galaxy collision supercomputer simulation shows the entire collision sequence, and compares the different stages of the collision to different interacting galaxy pairs observed by NASA’s Hubble Space Telescope. With this combination of research simulations and high resolution observations, these titanic crashes can be better understood. An interesting item in the news concerns this cluster and, in particular, a white dwarf called X9. This is a cluster that is some 14,800Lyrs away in the southern sky constellation Tucana. It is the 2nd brightest in the sky, after Omega Centauri in Centaurus, having been discovered in 1751. The news item relates to a white dwarf, X9, which is in orbit around the black hole in this cluster. It has an orbital period of 28 minutes and is the fastest star found orbiting a black hole, moving at some 12 million kilometres per hour, and is only 2.5 times the distance from the BH as the moon is from earth. This cluster is thought to contain millions of stars and covers an area of sky the size of the moon. The nearest star to us, apart from the sun, is Proxima Centauri at 4.2Lyrs. If we were in the centre of this cluster there would be 100,000 stars within that 4.2Lyrs. Although it used to be thought that Globular Clusters would not be a good place to look for Black Holes this view is changing. Although material is being ripped off the white dwarf into the BH accretion disc it is thought that it is not likely to follow it in any time soon as it will move further away as it loses mass. 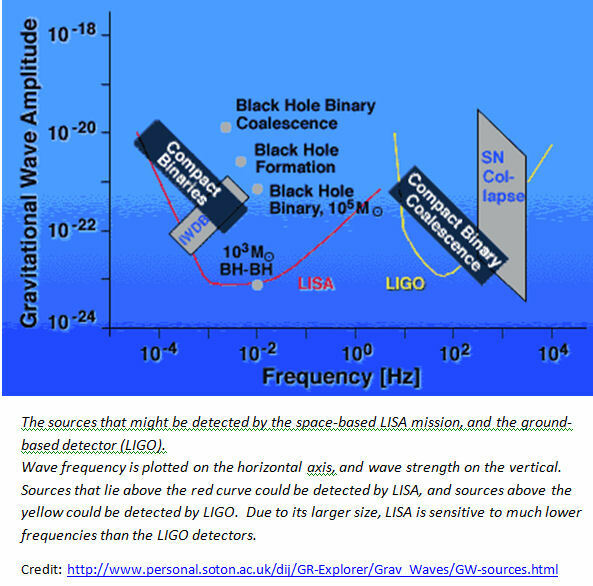 The LIGO instrument, looking for gravitational waves, is not sensitive enough to detect these waves from this event but a space based instrument, planned for the 2030s (may be!). See below for a bit more on gravitational wave sources/detection. I have tried to précis the info on the page, go have a look if you want more. 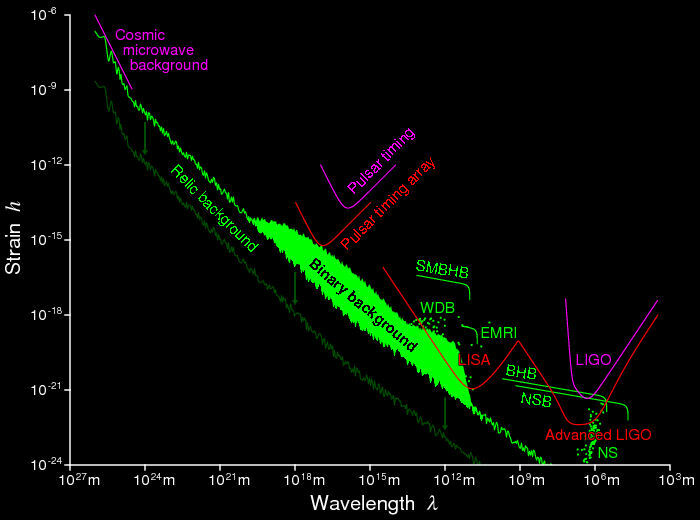 Referring to the picture below, the wavelength is on the bottom axis (longer wavelengths = lower frequency). Marked on the chart are various sources and also the range of current and proposed detection systems. NS (Neutron Stars): gravitational waves generated by individual neutron stars as they spin. NSB (Neutron Star Binaries): These are binary systems consisting of two neutron stars. BHB (Black Hole Binaries): These are binary systems consisting of two stellar mass black holes. EMRI (ExtremeMassRatio Inspirals): These are compact stellar remnants (white dwarfs, neutron stars, or stellar mass black holes only a few times more massive than our Sun) in the process of being captured and swallowed by a supermassive black hole. WDB (White Dwarf Binaries): Above the white dwarf stochastic background are a few thousand Individually resolvable white dwarf binary systems in our Galaxy. 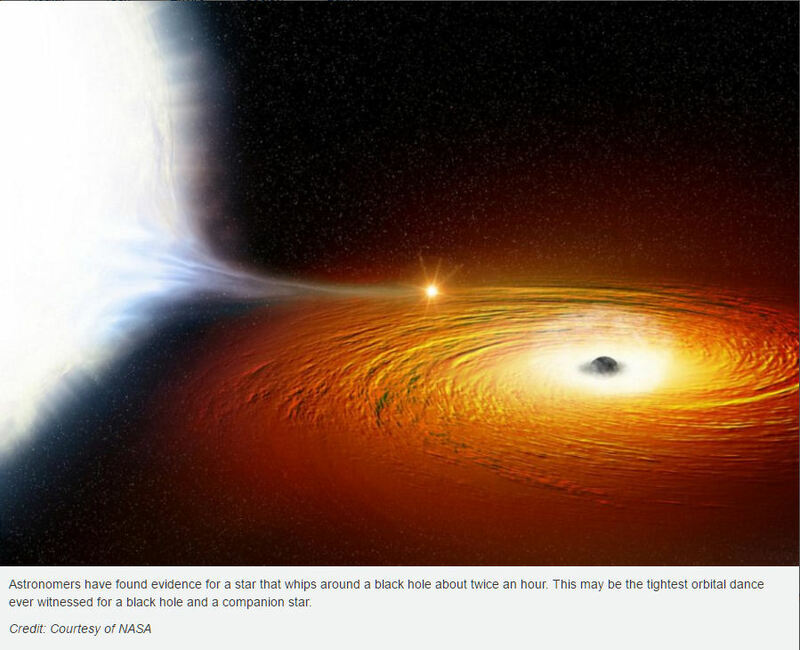 SMBHB (SuperMassive Black Hole Binaries): Occasionally two supermassive black hole systems will merge, producing a huge burst of gravitational waves at millihertz frequencies. Binary background: Random signals arising from thousands of binary systems emitting gravitational waves continuously in overlapping frequency bands. Relic background: From the Big Bang itself, consisting of quantum fluctuations in the initial explosion that have been amplified by the early expansion of the Universe. against vibrations or other outside disturbances. A passing gravitational wave changes the relative distances between the masses in the two arms, which can be detected by interfering laser beams travelling along each arm. Pulsar timing: Pulsars, spinning neutron stars emit beams of electromagnetic radiation, seen as “pulses” when they sweep over the Earth. Since the spin of a neutron star is very stable, these pulses can be predicted and fit with high precision. A passing gravitational wave alters the path length between the pulsar and the Earth, changing the pulse arrival times in a fluctuating manner. Advanced LIGO: Continual improvements to the LIGO detectors will result in an order of magnitude improvement in sensitivity. LISA (Laser Interferometer Space Antenna): A space based LIGO a million time the size of the earth based instrument. It will place three spacecraft in Solar orbit 5 million kilometres apart. The spacecraft would use laser ranging to monitor their relative separations, and thus would be sensitive to changes caused by passing gravitational waves. Pulsar timing array: Over the coming years it is expected that discoveries of new pulsars, improvements in the precision of pulse timing measurements, and longer observations of pulsars, will result in a dramatic improvement in the sensitivity of pulsar timing to gravitational waves. The “pulsar timing array” refers to this coordinated detection effort. It was thought that this referred to the current Event Horizon Telescope project. The shadow in question is the event horizon, the one way membrane around the black hole that marks the point at which light cannot escape. Material that falls into this region emits high frequency radio waves that can be detected by radio telescopes on earth. Question 2) Gravitational wave sources.